At last, nonstick cookware that lets you cook like a professional. Two surfaces make the difference. Unison cookware is built with 2 different nonstick surfaces for different cooking tasks, so you can use healthy, easy-to-clean nonstick to cook with professional precision. Ultra-smooth Slide pans release foods effortlessly for tender omelettes and delicate sauces. Specially-textured Sear pans seal in flavor and provide perfect browning of meats, fish, and vegetables. Clear tempered-glass lids let you see food while it's cooking and are oven safe, so you can finish covered dishes in the oven or keep them warm until ready to serve Flat, wide bottoms heat evenly and provide plenty of room for cooking. The sloped sides are designed for easy tossing and rolling. Long, quadruple-riveted stainless steel handles stay cool on the stovetop. All cookware is dishwasher-safe and carries Calphalon's full lifetime warranty. The flat, heavy-bottom pan has a wide surface to provide even heat, and the sloped sides are designed for easy tossing and rolling. Cook with confidence no matter what you have on the menu. 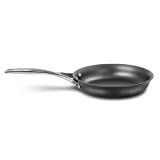 Heavy-gauge, hard anodized aluminum; Slide nonstick interiors. Handles stay comfortably cool on the stovetop.